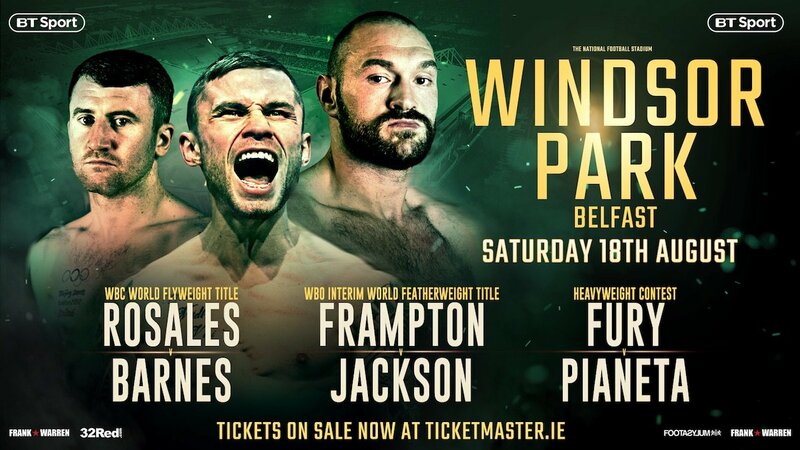 Hall of Fame Promoter Frank Warren has today confirmed further undercard details for the Windsor Park event on Saturday 18th August, headlined by Belfast Hero Carl Frampton’s defense of his Interim WBO World Featherweight Title against Australian Luke Jackson. Frampton v Jackson will be broadcast live and exclusive in the UK on BT Sport. An already mouthwatering undercard has been further strengthened with the addition of a Cruiserweight showdown between Steve Collins Jr and Steven Ward and slots for Irish stars Luke Keeler, Lewis Crocker and Marco McCullough. The bill also features The Lineal World Heavyweight Champion Tyson Fury, who continues his journey towards reclaiming the World Title belts that he never lost in the ring and Double Olympic Medalist Paddy Barnes’ challenge for the WBC World Flyweight Title against Chrisofer Rosales. In a surefire barnstormer, MTK Global Cruiserweights Collins Jr (12-1-1-KO4) and Ward (7-0-KO3) will clash with ‘Quiet Man’ Ward enjoying home advantage and looking to preserve his unbeaten professional record. Collins Jr – son of two-weight world champion and Irish Boxing Legend Steve Collins – will be looking to make his mark in his first fight of 2018 having been narrowly denied the Irish title by a points defeat to Paddy McDonagh last year. Dublin’s WBO European middleweight champion Luke Keeler (14-2-1-KO5), was highly impressive in securing the vacant belt with a points victory over Conrad Cummings at Belfast’s SSE Arena in April will make the first defence of his crown against a top rated opponent. Further down the card, welterweight KO king Crocker (6-0-KO6) is looking to continue his astonishing start to life as a professional. The Belfast boy has halted all six of his opponents to date inside three rounds – the latest feat a savage first-round stoppage of Adam Grabiec on the undercard of Michael Conlan’s homecoming. Another local star added to the action is super-featherweight Marco McCullough (19-4-KO11), who is out for the second time this year after outclassing Arnoldo Solano on the undercard of Carl Frampton v Nonito Donaire in April. McCullough has previously challenged for Irish, British, European and Commonwealth belts and is looking to continue his journey back into title reckoning. Promoter Frank Warren said: ‘I’m delighted that further Irish talent has been added to this already bumper card. The Ward v Collins Jr showdown is set to be a great fight for the fans on a card that already boasts Frampton v Jackson, The Lineal World Heavyweight Champion Tyson Fury and Paddy Barnes’ World Title challenge against Cristofer Rosales. I’ve been very impressed so far with Lewis Crocker who looks to have a great future and in my experience of promoting cards where Marco McCullough and Luke Keeler have featured, they are always in entertaining fights. Limited remaining tickets are available from www.ticketmaster.ie. priced at £80, £100, £120, £150, £250, £400 (includes hospitality).